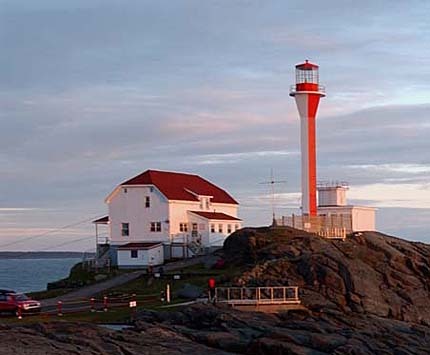 For visitor information, go to Cape-Forchu-Lighthouse on Facebook. The Cape Forchu lighthouse, on a headland at the south western tip of Nova Scotia, is the light for the town of Yarmouth and its harbour. The structure rests 37.5 meters (125 ft.) above sea level, is nestled into jagged rocks and offers a breath-taking natural vista. 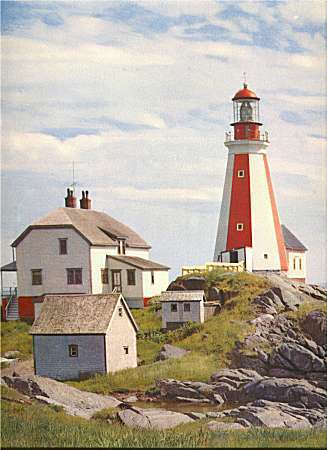 From a poster showing the first Cape Forchu Lighthouse known as "The Old Yarmouth Light." The Cape Forchu light has always been a tourist attraction. The old timber tower was much photographed, so when the Coast Guard decided in 1961 that it must be replaced, town and tourist officials requested that the new light tower be built along the lines of the old. In October, they were assured by their MP that the new tower would be an outward replica of the old and "there will be no change in the splendid harbour vista." There was considerable controversy, therefore, when the community saw the concrete "apple core" tower rising at the head of the Cape! Many thought the vista was ruined. But, tourists continued to flock there and by 1980 the "apple core" itself was being called "the old Yarmouth light!" The additional height of the 22.9 metre octagonal concrete tower and the added power of the new dioptric lens added 10 miles to visibility, so that the light can be seen for 22 miles to seaward. Electricity is provided by a cable run from the town of Yarmouth. 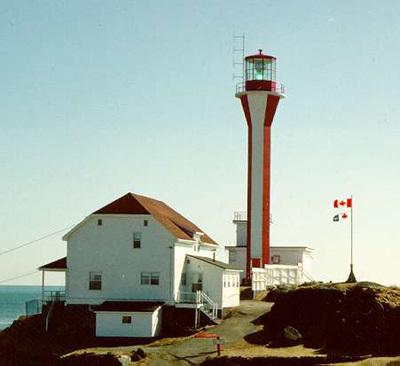 In 1980, Cape Forchu became the monitoring station for automated lighthouses on the South Shore, using the Intrac 2000 system. 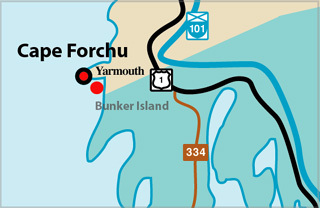 In 1993, Cape Forchu was automated and destaffed. Monitoring was transferred to L'Etete, New Brunswick. Cape Forchu is Nova Scotia's only intact lightstation open to the public. All the others have lost one or more keeper's houses and outbuildings. The big keeper's house, built before 1940, is now a museum. As well as viewing artifacts and photographs you can enjoy delicious seafood chowder and a cup of tea or coffee. There is also a later keeper's house which is now a gift shop. The Canadian Coast Guard Flag was flown below the Canadian Flag when lighthouses were staffed. 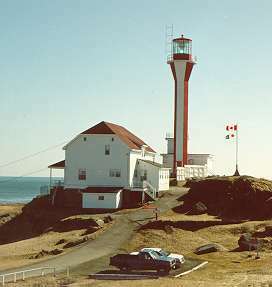 The Cape Forchu Light Station was the first light station in Canada to be passed over to a municipality by federal government divestiturehe under the "96-1" arrangements. Through the untiring efforts of volunteer Craig Harding, the lighthouse, land, and all the buildings were deeded to the Municipality of Yarmouth County by the Department of Fisheries and Oceans in March, 2001. Tragically, Craig died of cancer that April, but he was presented with the deed before he passed away. Craig led the Friends of the Yarmouth Light in a six year fight to save the station for public use. It was in grave danger of being sold to developers. The magnificent rocky site, with a grand view of the entrance to the Bay of Fundy, is now preserved for everyone to enjoy. The NSLPS Craig Harding Award is awarded annually in his honour to a person or group which has done exceptional work to save Nova Scotia’s lighthouses. 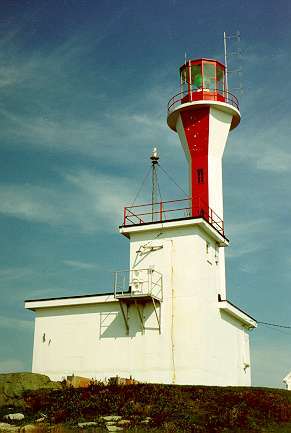 The light station is run by the Friends of the Yarmouth Light on behalf of the Municipality of Yarmouth County. The Friends keep everything in excellent shape. This magnificent site is well worth a visit! Recipient, first Craig Harding Award for Lighthouse Preservation, 2001, along with Craig Harding. Located near the extreme southwest portion of Nova Scotia, Cape Forchu is a forked tongue of land, discovered in the 17th century by Samuel de Champlain, at the west entrance point into the busy Yarmouth Harbour.It is a light viewed by thousands annually as they enter Canada from the United States en route from two ferries that serve the Harbour. From the base of the light, there is a magnificent view of the Gulf of Maine to the west, which is enlivened even more by the sertting sun. A view to the south shows several off-lying islands, and during certain times, a body of water teeming with busy fishing boats and crashing waves. Tower Height: 059ft feet high. Light Height: 117ft feet above water level. Tower Height: 075ft feet high. Light Height: 123ft feet above water level. Solarized: This light has been solarized. 1995 - lease obtained on the land by Yarmouth Co. Tourist Assoc. Although Marlorie Fairservice was the last lightkeeper, bear in mind that she was not carrying out traditional keeper's duties (as were none of the last three), but mainly kept on to monitor the Intrac equipment, as Cape Forchu was the main monitoring point for about 20 stations.